Is Your City Planning Ahead? 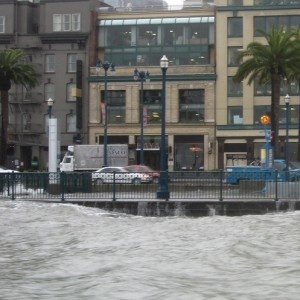 Flooding along San Francisco's Embarcadero during an extreme high tide in February, 2011. With little being done at the national and international level to cut carbon emissions and curb the march of climate change, more and more communities and institutions are seriously considering how they will adapt to the environmental changes that lie ahead. Sea levels are rising, and in the Bay Area, planners are expecting an increase of nearly five feet by the end of the century. According to climate models, temperatures across the state are likely to rise between three and seven degrees Fahrenheit by 2100, leading to increased heat waves and stressing the state’s water supply. So, are we prepared? Not really, according to a story today on the public radio program Marketplace. And yet, as reporter Sarah Gardner explains, there are communities, including some in California, that are taking action now, and investing real money, to protect themselves (and their real estate) from the changes ahead, despite current fiscal challenges. My town, Morgan Hill, is doing a few things. For one, they are investing in solar PV where they can. The public schools have done the same at the two local high schools. However, there are two areas that they are not yet doing what needs to be done. The most important, and one you did not mention here, is the water supply. The other is to use smart growth ideas to get people out of their cars as much as possible. Where growth (needed to pay for past projects) is the major goal, the “smart” path is soon forgotten.